It is a bench type press rollers structure. There are three cylindrical rollers. One locates on top and two on bottom. A top hand wheel is used to rise up or lower down top roller. Rollers are heat treated and surfaces are hardened. Gears are carefully selected for durable purposes. There is an electric motor and a gear system located beneath press rollers. They transfer transmission power and adequate torque to press rollers. Top roller's height is adjusted. Spacer bars are put in between top and bottom rollers. By pressing a button, motor is activated to drive press rollers through transmission system. It directs spacer bar into rollers gap. Spacer bar is curved while passing rollers gap. If radius of curvature of spacer bar is small, top roller is turned downwards to narrow rollers gap with bottom rollers. If it is large, top roller is turned upwards to broaden rollers gap with bottom rollers. The smallest radius of curvature the tool could curve is limited by rollers' radius. The largest radius of curvature is infinite. If radius of curvature is incorrect after curving, turn top wheel until rollers gap is adjusted to requested level. Spacer bar is driven into rollers gap again to redo the curving. This could be repeated until final radius of curvature is obtained. 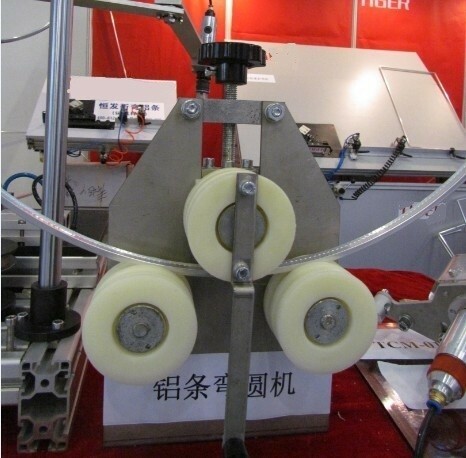 This electric motorized spacer curving machine reduces workload. Spacers' radius of curvature is consistent.